Prima Road is a short road that runs from Clapham Road to Brixton Road and faces St Mark’s Church. Prima Road is one of the oldest streets in this area, originally called Church Row or Church Street it was renamed in 1912, quite why the name Prima Road was chosen I am unsure, if anyone knows what is behind this name then give me a shout in the comments box below. Prima road belonged originally to a plot of land called the Wright Estate. British History Online tells us that “Prima Road was laid out about 1794, when the property belonged to John Wright of Esher, banker. 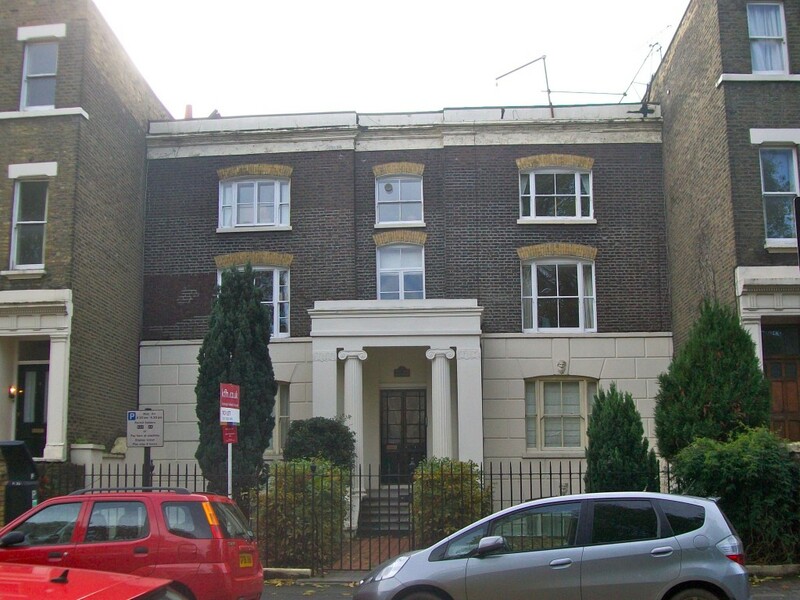 Wright granted several building leases of plots fronting Clapham and Brixton Roads”. 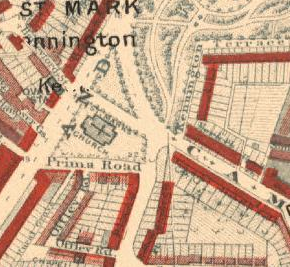 Back then Prima Road would have had uninterrupted views of Kennington Common, what we now know of as Kennington Park. 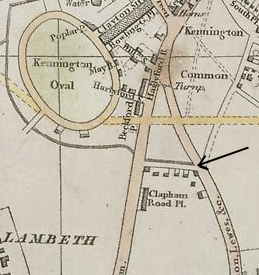 Originally Prima Road faced the part of Kennington Common where the Surrey Gallows stood, a fairly grim view or a front row seat depending on your outlook. At least two hangings took place after the building of Prima Road. In 1795 Lewis Jeremiah Avershaw an infamous highwayman, was executed for shooting a Peace Officer and then in 1799 the last person to be hanged at the common was a fraudster from nearby Camberwell by the name Badger (1.) This makes the Surrey Gallows one of the last public hanging spots in London as the infamous Tyburn ended public execution six years earlier. St Mark’s Church was then built in 1824 on the site of the gallows and remains there to this day. Or more accurately under it. The Effra is a river that once flowed above ground all the way from Crystal Palace down to the Thames at Vauxhall. It has an interesting history and you can read more about it here. The river flowed right across the northern part of Prima Road where the fence enclosing the church now stands, you can see the Effra indicated by a small line on the maps below. The area that Prima Road stands on was once very marshy and would have required draining before building took place. The river was then built over between 1837 and 1857, St Marks’s paid £322 towards the costs. 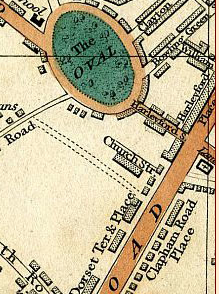 The raised banks of Oval cricket ground were built with earth excavated during the enclosing of the Effra. The map above is “Laurie and Whittle New Map of London with its Environs, including the Recent Improvements from 1809” and although unlabelled Prima Road is clearly visible (indicated by the arrow) and had been standing for fifteen years by this point. “Pigot & Co.’s Metropolitan Guide & Miniature Plan Of London from 1820” shows Prima Road and the surrounding area eleven years later. 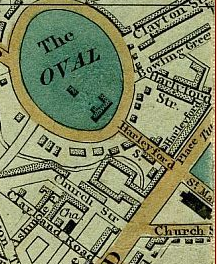 “Cary’s New Plan Of London And Its Vicinity” shows the area another seventeen years later in 1837, St Mark’s Church is now clearly indicated in the top right corner of the map. “1850. 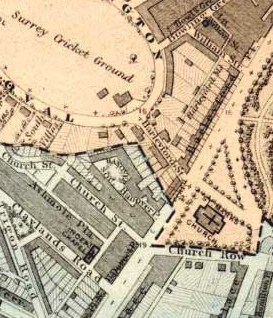 Cross’s New Plan Of London 1850” shows the area around Prima Road which is clearly then labelled as Church Street. 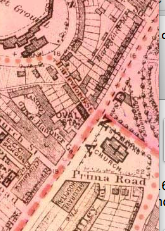 The map above is a Lambeth Ward Map from 1876 showing the division between the Vauxhall Ward (light blue) and the North Brixton Ward (pink) Prima Road is labelled as Church Row. 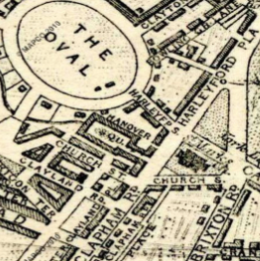 Charles Booth’s Map of London Poverty research took him to Prima Road in 1895. The Map above is from 1898 and shows how Booth graded Prima Road. The key to what the colours mean can be seen to the right of the image. 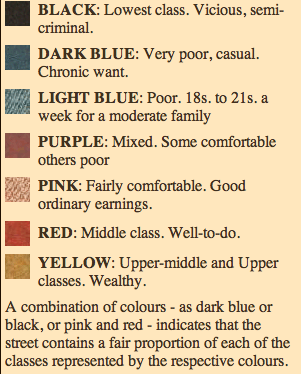 For more information on Charles Booth and the classification of poverty see here. 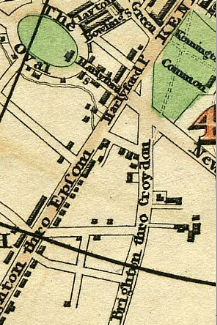 Prima Road can be seen on this 1918 Ward Map with the old name of Church Row or Church Street renamed to Prima Road. Many of the streets in our area were scarred and altered by the bombings in WWI and WW2 however Prima Road appears to have escaped unscathed. It must have been hit with an almighty wall of blast however as St Mark’s church was almost completely destroyed and rebuilt, the only parts to survive were the Grecian facade and pillars, topped by the small cupola and cross. I lived in this house, on the top floor, between 1968 & 1971. Thanks for the interesting information. I was always led to believe that it had, at some time, been the vicarage of St. Mark’s Church but have never had it confirmed as so. My eldest son was born during my stay there and he will be delighted that I’ve come across this history. I also heard that there is a tunnel that runs from this house (number 5) to the crypt of St Marks Church. I was born in this house in September 1960, following my older sister who was born 2 years earlier. My grandmother ran the house as a boarding house, and she rented rooms to some of her family. My dad was born there in April 1932, so we have a long history in the house. My grandfather, Ernie Pullinger, moved into the house with his parents in 1910 or thereabouts, when he was 10 years old. We rented the house, rather than owned it, sadly, from the family who owned Churchill Advertising Hoardings, who had a yard at the back of the house. I would expect it is worth a lot of money nowadays. My dad tells me that Sharwoods Spices also had a place behind the house, and the back garden was able to be accessed from Offley Road. The family used St Marks across the street for hatchings, matchings and dispatchings. we have many photographs of the house and the church. My family, the Gagers lived in 7 Prima Road and 4 Prima Road(and Belgrave House/Hospital for a short time). Our family, the Armstrongs also lived in number 7. The Byrne/White family lived in number 8 for many years before moving to Ireland 16 years ago. The Websters lived at Number 3 during this time and still live there now. The Knoblets lived in number 5 through the 80s and 90s. 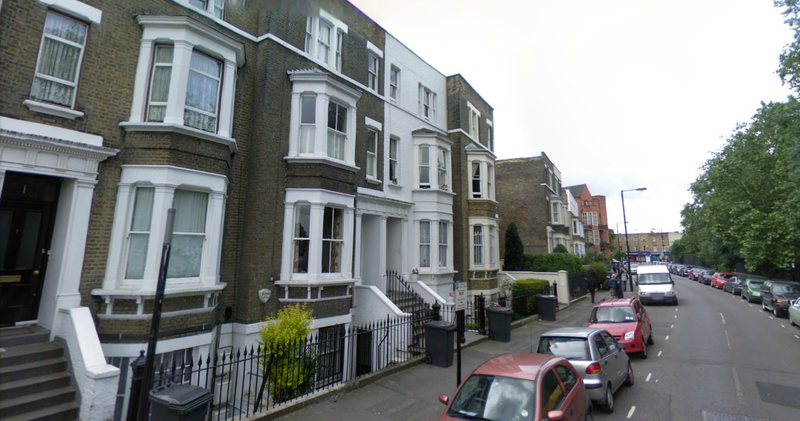 One of the houses was a toy library on the Clapham end of the street during the 80s. The St Marks Priest always lived at number 1. St Marks bought 1 Prima Road in the late 1960’s. The curate lived in the basement flat and the Parish Worker in the top floor flat whilst the first floor flat was rented out.